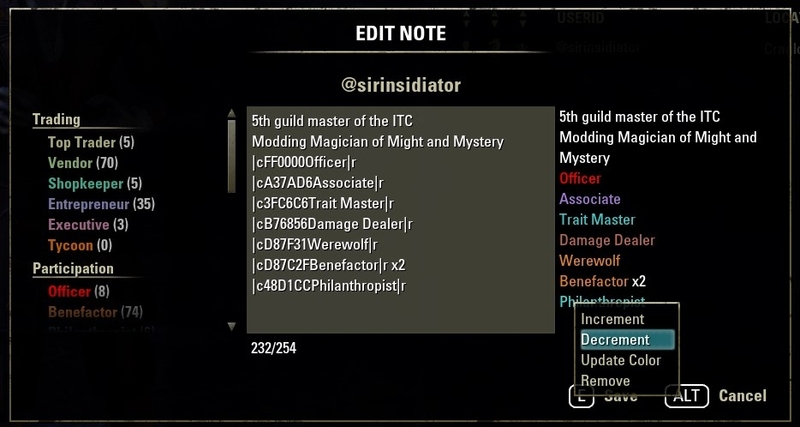 Originally a simple addon to filter the different badges on the Aetherius Trade guild roster it has now evolved a bit and is usable for any guild that has an interest in using badges. The addon will add a new button on the guild roster right of the "Filter By" label, which toggles the badge filter window. It is possible to select multiple badges in the filter list by pressing and holding shift when clicking on an entry. The slash command "/abf" allows to toggle the window. 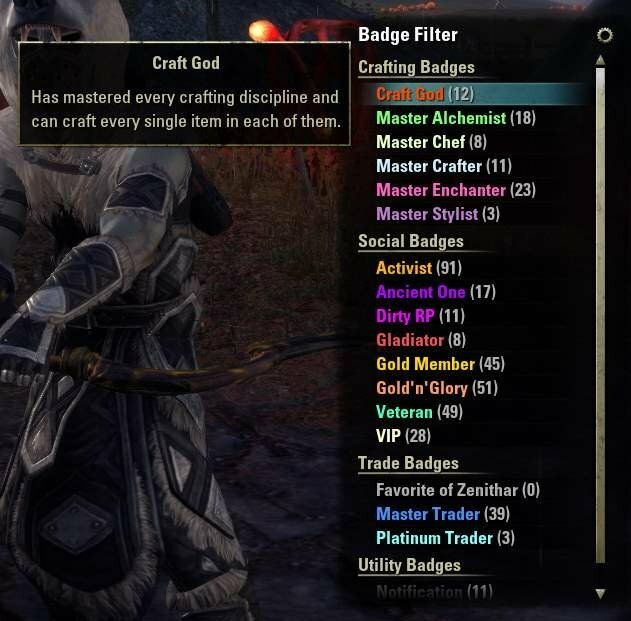 Badges are simply labels with a color format placed in the notes of a guild member. For example |cFF0000My Badge|r is a badge. It is important that it has a "|c", 6 hexadecimal values for the color and the "|r" after the label. Unlike ranks, badges are a lot more transient and versatile as they are not limited in their number*. They also do not require you to set up any permissions and thanks to the description property you can confer more information about a badge than you can add about a rank. With a good set of badges you can add a lot of value to your guild. There are two ways to activate the filter for your guild. 1) You can simply add the name of the addon - Aetherius Badge Filter - with or without spaces to the MotD or About Us section in your guild. The addon will then activate itself upon detection and show all badges that are found in the roster. To deactivate it again, you just need to remove the text and it will simply disappear on the next UI reload. This mode is convenient if you don't want to create a data file, but due to the way it all works you won't be able to define a description for a badge and groups will also be unavailable. 2) You can create a data file that registers your guild name for a server. The filter then automatically scans for these badges and lists them in alphabetic order when the "Show scanned badges" mode is active. In addition you can also define a list of badges with custom order, groups and descriptions in said file, which allows for a more elaborate badge setup in the "Show defined badges" mode. name = "MyGroup", -- optional, groups without a name do not have a header. This is only really useful for the first group in the list. In this mode the order of badges and groups entirely depends on the order you use in the data file. The example can also be found in _Example.lua in the data folder. In order to test a newly created data file for yourself, you need to add the path to the end of AetheriusBadgeFilter.txt in the addon folder. Otherwise the game won't load the new file in the data folder. Afterwards you need to reload the UI with the /reloadui slash command. Once you finished testing, upload it somewhere and send me a link. I will then proceed to upload a new version of the addon which contains the data file for your guild. When editing a note on the guild roster of a guild with Aetherius Badges, the editor dialog will be extended with new elements. On the left side of the textarea, the list of available badges will appear, on the right side you can see a preview of the note and below the note you see how many characters you have left. When you click a badge in the list on the left side, it will automatically be added if it is not present in the note. Increment - This entry shows up for badges with a limit (>1 or false). When the limit is reached and turnsInto is defined, the other badge will automatically get added or incremented. Decrement - Same as the Increment entry, this will only show up for badges with a limit. It will never decrement the count below 0. Update Color - This will show up for badges with a defined color when the entry in the note uses a different color. Remove - Is always available and will delete the line with the badge. The editor only recognizes one badge per line, so make sure that you do not have more than one. When the badge count is changed, it will try to parse the part after the badge and update any number it finds. It also won't recognize more than one of the same badge in one note and might do unexpected things in that case. Before pressing save, check the generated note text for any errors. You can always just press cancel and start again when something went wrong. make sure to enable the dependencies LibStub and LibCustomMenu in your addon menu! IMPORTANT: make sure you remove the old addon folder to avoid conflicts! Last edited by chruikan13 : 12/24/18 at 01:02 PM. been working on a file for my guild i have a few questions wondering if your still working on this addon and wondering if there are a few things that could be added. Bait Trading House kann raus. Ist geschlossen. Danke dir, er schließt Trollerei von einem Mitglied nicht aus. Er hat die Notizen auch nachkontrolliert, dass nach Eingabe der Eintrag auch da war. Einen Tag off, am nächsten Tag weg - klingt auch für mich nach Troll. Ich lass dir die Tage entweder eine oder sogar zwei neue Gilden-Files zukommen. Zum Problem: Ursache gefunden - guild events. Last edited by Verbalinkontinenz : 11/12/17 at 09:45 AM. ein Freund, der Destruent, fragte mich zu einem "Problem" mit ABF. Er hat es über die Gildennachricht aktiviert, also noch nicht als .lua hinterlegen lassen. Gerne kann ich sie zu gegebenen Zeitpunkt vorbereiten. Es scheint, als würde ABF ab und an "Badges" aus den Notizen wieder zu entfernen - richtig einordnen kann er das Problem aber noch nicht. Ich gebe es auch nur wieder und habe kaum Handhabe das momentan zu überprüfen. Das kann ABF nicht. Notizen werden vom Addon nie direkt verändert. Es werden nur im Editor zusätzliche Buttons angezeigt damit man den Inhalt im Eingabefeld verändern kann. Hat er vielleicht den Mitgliedern nicht das Recht zum Editieren entzogen und irgendjemand löscht sie? Last edited by Verbalinkontinenz : 11/12/17 at 06:07 AM. The last ABF update is awesome, thanks! Ooo, this looks really neat! 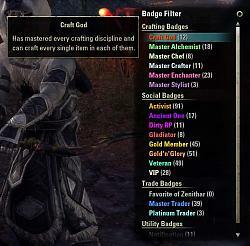 Would it be possible to make a set of generic badges(Crafting, Vamp/WW, etc) that works on all guilds by default, without having to edit luas or motd, to make the addon more plug-and-play friendly so to speak? Or would something like that not work by design? 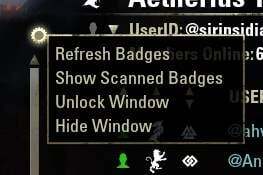 That would not be useful if the guild in question does not actually makes use of the badges and I don't want to force the filters to show up in guilds that do not have an interest in it. Besides a guild can use any badge they want once they add the keywords "Aetherius Badge Filter" into the the MotD or About Us. If they like what they see they can just submit a lua file in order to take full advantage of all features. So no, I do not plan to add a set of default badges that shows up in all guilds. Возможно ли заставить аддон работать с режимом геймпада? I don't speak Russian, but if Google Translate is correct, you are asking about a gamepad version? As I don't play with the gamepad interface myself, I don't have any plans to support it on my own. If someone wants to contribute gamepad support, they can send a pull request on github. It adds a very useful feature for keeping track of Guildies and it is quite an unique feature for the Guilds that use it. Thanks a lot for this addon and for supporting other Guilds. Cheers for such great addon. Keep up the good work. Really helpfull addon, big thx to author.